This house is called the Whritenour House (pronounced Rittner) after the several generations of Whritenours who lived here. This building was moved here - like the Ward-Ryerson-Patterson house - from the course of the Monksville Reservoir, in 1985. 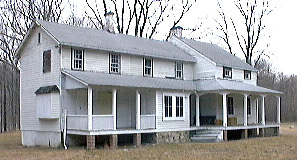 The oldest part of the house, constructed about 1813, is in the center, between the two chimneys. The house grew with additions until the late 1870s when it looked much as it does today. This is a "satellite" farmhouse. Mathias Whritenour raised sheep, drove a wagon (teamster), mined ore on his property and also practiced as a Methodist minister - it often took a whole repertoire of skills to make ends meet. The lawn area here and the walking path were part of a landscaping project completed for a Boy Scout Eagle Project several years ago. By 2002 there have seven Eagle Scout projects at Long Pond and many more are planned.